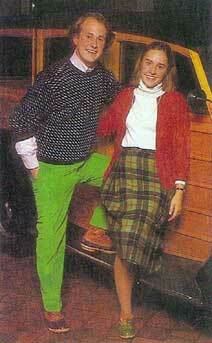 An iconic preppy photo from the 1980s. We’ve all seen it. My questions are: who are these people? Were they a couple at the time of the photo? Are they still a couple? If you know, contact me and, if you live in the continental US, I’ll forward a free personalized and autographed copy of The Old Money Book to you as a way of saying thanks. Limit first ten responses. I’m so curious! I don’t know who they are, but I believe this picture first appeared in an article by Nelson W. Aldrich, Jr. called “Preppies: The Last Upper Class?” in the January 1979 issue of Atlantic Monthly.